IJAHS is a International Journal of Art & Humanity Science which provides a open access to users for worldwide research publications. IJAHS covers a wide range of latest outstanding developments in the field of social science, history, environment and other educational sectors enabling authors as well as researchers to publish their work online through our quality open access journals possessing high degree of peer review ethics as well as clarity. We along with our dedicated team of highly skilled and experienced editorial and technical team members ensures that quality is maintained in every research paper publication such that authors could represent their work globally in the best possible way to receive international acclaim. For this reason our editorial board is constituted of a prestigious team of experienced professionals from different educational fields who take proper care of the quality as well as the review standards following international research publishing standards and facilitating quick publication of the research papers. All the approved and published research papers are made available online with free and open access. Furthermore, IJAHS being a online publication also provides a platform to authors as well researchers to promote their work at faster rate as it promotes their work globally with the help of high indexing websites such that authors work is reached to the target audiences effectively and quickly. We also welcome your suggestions in our official email address on editor@ijahs.com for the improvement of our online journal. We understand that your suggestions can be very beneficial for us and we will surely implement it as soon as possible. We also help to improve the paper of the authors with the help of our "Team IJAHS" and “Member of Editorial Board" when we guide to improve the quality and format of the particular paper. We are presently covering all the fields of engineering and technology which author can find in the "aim and scope" section. Additionally, we also provide the live support, email support and telephonic support where we inspire and suggest the proper way of research paper writing. Moreover, authors can also find the initial guidance in “Author Instruction" section. If authors face any problem they can go to “contact us" menu and contact us. Submit Your Quality Research Work Submit your paper for quick review! Check Your Mail For Manuscript Get the experts reviews and feedback. Successfully Published Not wait for long! Get benefit of large Editorial Team. Call For Paper We invite you to submit high quality papers for review and possible publication in all areas of engineering, science and technology. All authors must agree on the content of the manuscript and its submission for publication in this journal before it is submitted to us. All the manuscripts submitted for publication are first peer reviewed to make sure they are original, relevant and readable. Manuscripts should be submitted via Online Submission only. 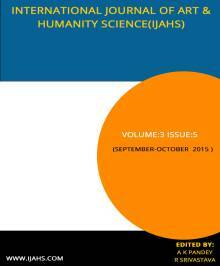 IJAHS Aim & Scope The Main aim of IJAHS that is International Journal of Art and Humanity Science is to publish articles related to various fields including Arts and Humanity. It invites high quality researches and studies on various different fields like Science, Technology, finance, commerce, Environment, Social issues, Law, Educational sector, Religion and many more. How to Publish a Paper Author's Instructions: All the researchers, scholars and practitioners are invited to submit their research manuscript in our next issue. Manuscripts may either be submitted online or through mail. Online Submission of Manuscripts: For online submission of the manuscript authors need to submit one copy of the full paper including all graphics and figures at the online submission site, accessed via E-mail. editor@ijahs.com.